The Lawson® Model "M" paper drill is the next generation on the well known model "B" paper drill. The model "M" has been design to the same exact standards that have made the Dexter-Lawson brand the most widely used heavy duty paper drill. 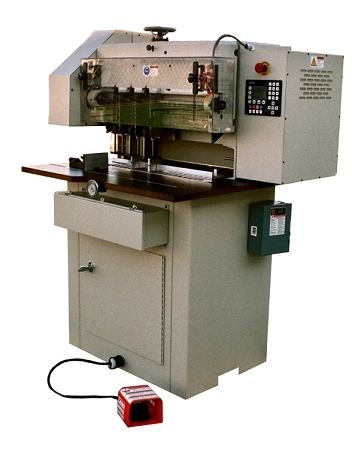 This machine with it's three lift height and gear-driven head rail, is designed to meet the needs of the high volume bindery. This machine can drill up to ten holes, if required, and will not stall in drilling. Because of it's weight and design, the model "M" will run very confortably in a 24/7 setting. Drill size 1/8" to 1/2"